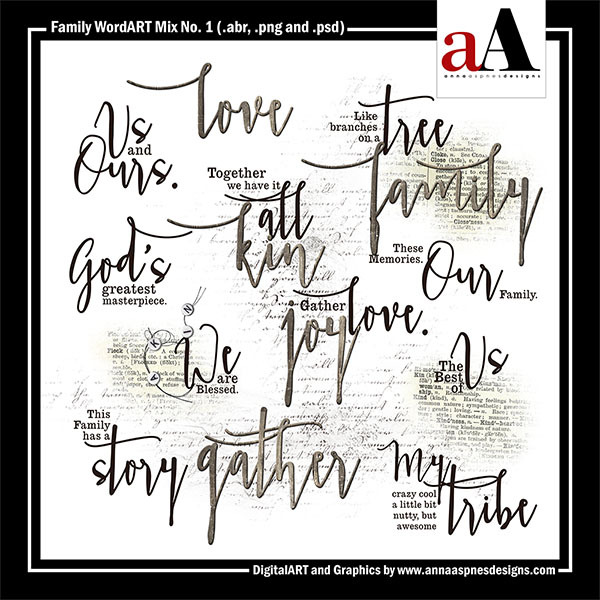 A collection of 21 varied, family-themed WordART elements to include 5 WoodWords, 10 WordART quotes/titles, 3 WordTransfers, 2 ScriptTease Overlays and 1 BeadedThreadz designed to be mixed and matched to create custom WordART titles. I have also included the WordART, WordTransfer and ScriptTease designs in brush .abr format. Files are delivered in .png format unless otherwise noted. Guidance on the use of my designs in Photoshop and Elements can be found in the Instructions for Use eBooklet which is available as a free download from the store and in the videos on the aA Youtube channel.